Attention – now, it’s getting really funny! This is how I started with Instagram back in 2011/2012! 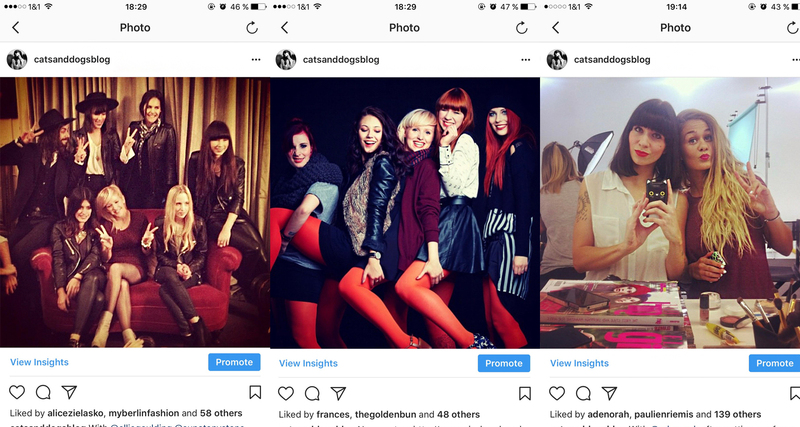 My sweeties, today, I have got something really funny for you – my Instagram beginnings! I crolled down to the very bottom of my Insta-feed (and that’s 2.138 pictures after all) and found some real special pictures just for your amusement! 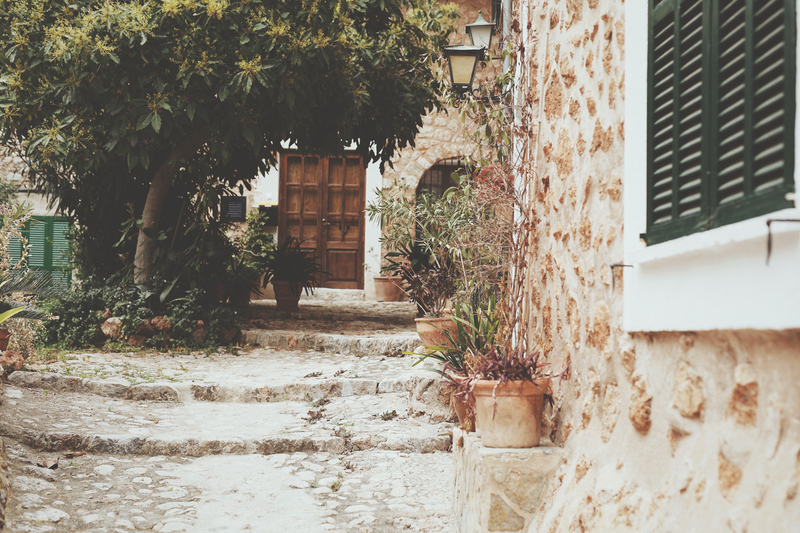 When did you start with your Instagram if you have one? And did it also change sooo much? But also tell me, how do you like this post? Is it just as funny for your as for me?? Do let me know, I can’t wait for your comments! 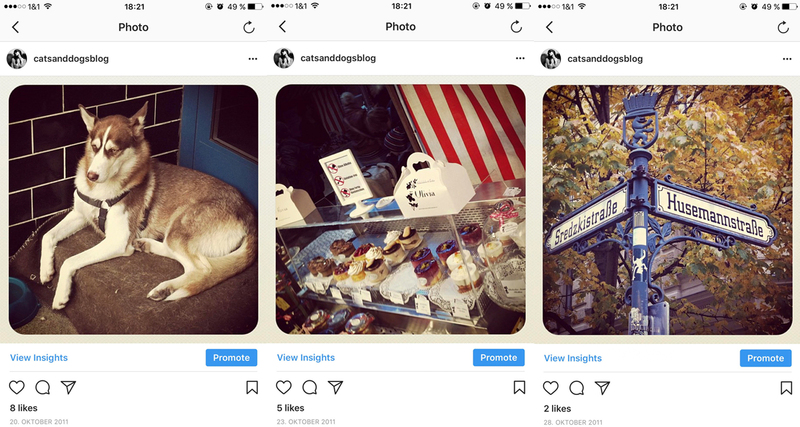 Okay, a dog – that’s what I uploaded first on Instagram… then a market stand and a street sign from Berlin. Wow, what an amazing and artsy way to start my feed. Well, I guess I didn’t care back then. 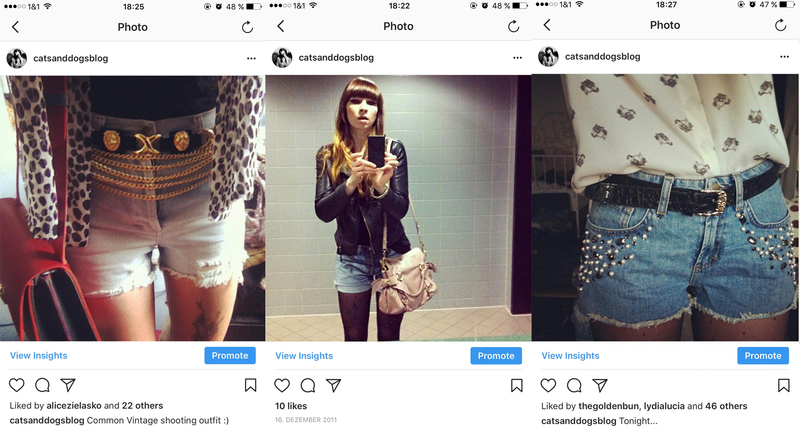 No matter if with chain belts, pearls or just with black tights from autumn to spring, I always needed to wear denim shorts! And of course I had to show them to my huge Instagram-following, hehe. First, I bought the Miu Miu bow-bag in pink (an impossible colour for me these days), then, the IT-PIECE that every blogger needed to own: remember the Miu Miu swallow print mary-janes? And finally, my wonderful Chanel 2.55 double flap bag, awww… and it got amazing 7 likes, hehe. 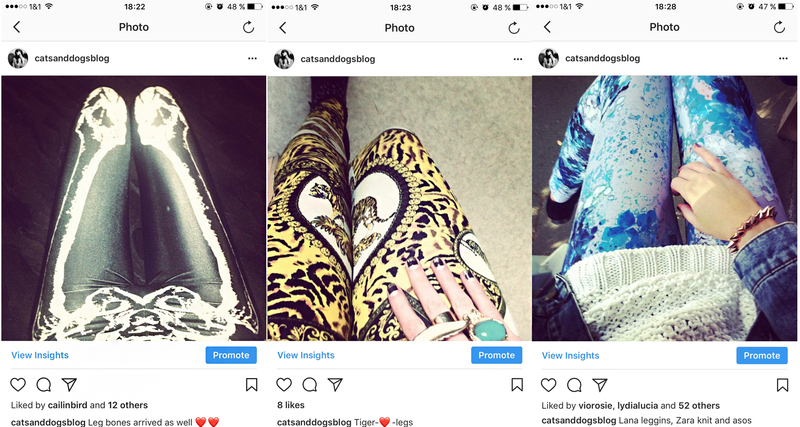 What was I thinking when back in 2011 and 2012, I bought all these horrible printed leggins?! I don’t know, it was just soooo trendy and I felt sooo cool wearing these beasts. I even wore them to work (elementary school teacher) and I really wish I could travel back in time to forbid myself to wear these or even consider buying them! #Armparty, yes, it was a hashtag just as popular as #fromwhereistand. And I really didn’t do little to look my part. 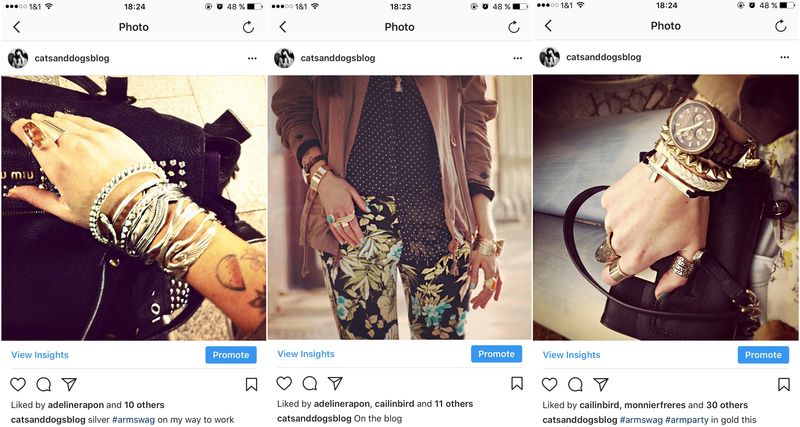 I loved wearing ten tons of bracelets and rings and I can’t understand now how this didn’t bother me. I even wore this kind of jewelry-mountain to work (elementary school teacher!) and it felt totally legit! 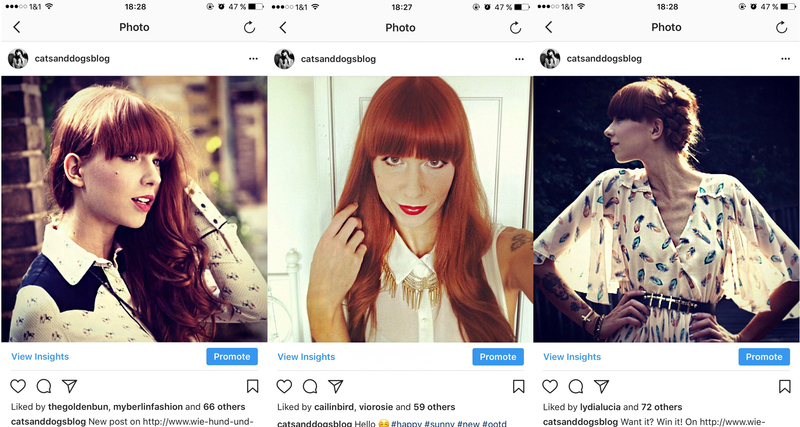 Oh yes, sometimes, I tend to forget that I used to be a redhead in 2012… but for only a few months. Even though I really loved the ginger look, it was too much work always re-dying the grown out parts. So by the end of 2012, I had already turned back to my dark hair and cut off so much of it because I had destroyed it with the bleaching. Oops. Hehe, can you recognize them?? @dulceida, @alicezielasko, @antoinetonystone, @adelinerapon, @wearelikeariot, @glitter_everywhere, @frances, @masha, @adenorah – And where is Ellie Goulding hiding?? ahh wie cool- super idee! 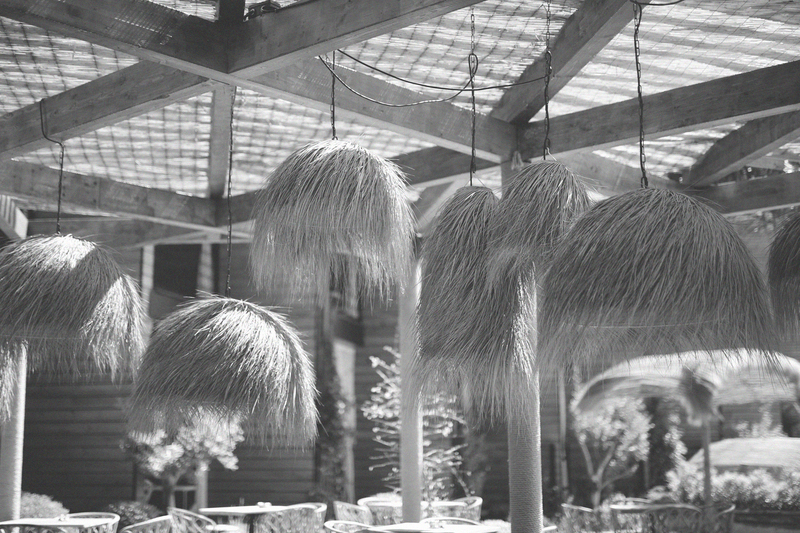 die filter waren damals auch einfach noch sooo anders! muss auch mal ein bisschen runterscrollen bei meinem instaaccount, das sorgt bestimmt für lachanfälle :D schönen sonntag! 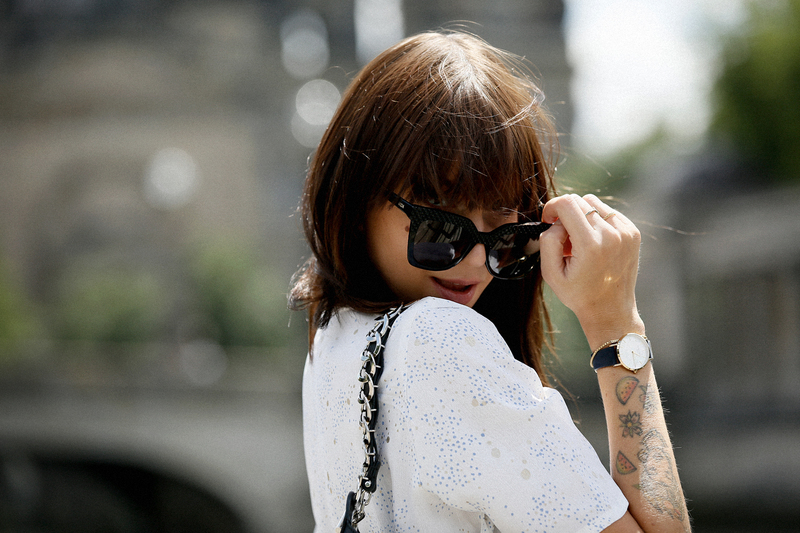 You have always been incredibly stylish <3 love your style, you are such an inspo! Hey, ich finde solche Rückblicke auch immer wieder spannend :). hahaich liebe solche posts einfach! 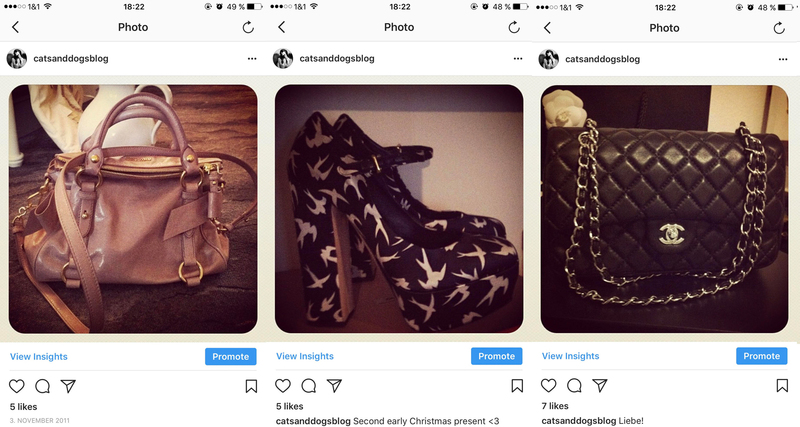 so krass wie instagram sich verändert hat ..
Ich bin entsetzt, 7 Likes für die Chanel Tasche? Ich wäre direkt bei dir vorbei gekommen, um sie zu klauen! Ein wirklich lustiger Post – danke für den Start in die Woche! Genial. Es ist wirklich interessant wie sich deine Bilder auf Instagram verändert haben. Danke schön, es ist lustig aber auch sehr instruktiv! :) Es ist immer erstaunlich, wie eine Persons Stil ändern kann. Was für ein toller Post, meine liebe Ricarda! Ich musste grad so lachen, weil ich an meine IG-Anfänge zurückdenken musste und einige ähnliche Fotos in meinem Feed hatte! Besonders an #armparty und #armcandy kann ich mich noch super erinnern!